At five years old, U.S. Poet Laureate Juan Felipe Herrera watched border patrol arrive at a neighbor’s home, pull the family into a van and leave. Nearly 60 years later, he still remembers that day. Herrera, the son of migrant farmworkers in California, has come face to face with stories of immigration and deportation throughout his life. Now, in a time of divisiveness in America, the first Latino poet laureate is attempting to break down walls between communities while working under a presidential administration that has threatened to build them. For Herrera, the story of deportation is nothing new. Thanks to a childhood riddled with friends’ and family members’ interactions with border patrol, he’s familiar with issues of immigration, though for many, it’s a new hot topic in national politics. Despite the Trump administration’s threats to deport undocumented immigrants and Trump’s campaign promise to rescind Obama’s Deferred Action for Childhood Arrivals (DACA) program, which allows certain undocumented individuals deferred deportation, Herrera said he will remain an employee of the Library of Congress. 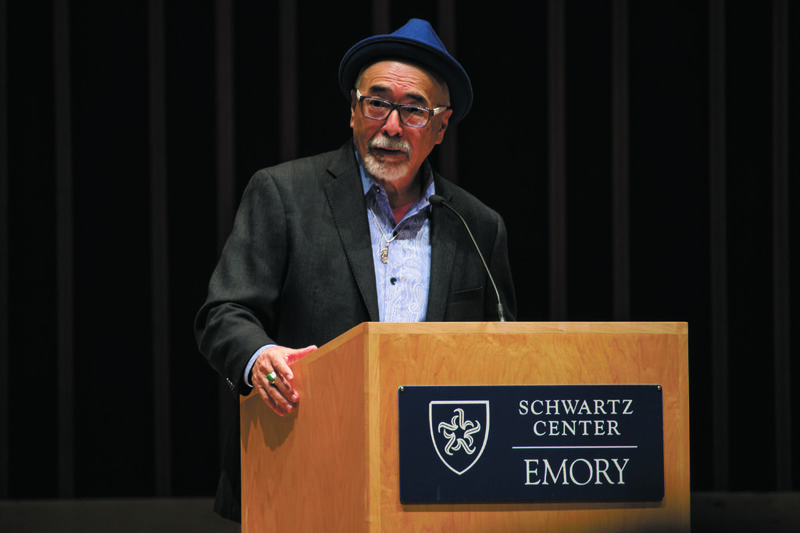 He spoke at Emory Sunday, Feb. 19, reading poems about deportation and immigration in the 12th season of the Raymond Danowski Reading Series. He condemned the “border machine,” the institutions that enforce the U.S.-Mexican border such as detention centers, border patrol, police and the necessitation of being “approved” to cross into the U.S. in an interview with the Wheel. He compared the “machine” to the U.S. internment of Japanese-Americans in the 1940s, denouncing the “segregation” caused by the camps. Herrera preached inclusion and compassion over violent responses, pointing to the violence perpetrated in the late 1960s Civil Rights movement. The violence, he said, made some small gains but did not work, and it’s not the kind of response he believes will create lasting change. In his position as poet laureate, Herrera’ storytelling brings communities together. His poet laureate project, La Cases de Colores, employed the power of the internet to create a collaborative epic poem written by Americans nationwide. Herrera urged individuals to share their stories of immigration, to use libraries and archives, to translate their work and to become bilingual in his interview with the Wheel. All we have are words, Herrera said. He encouraged aspiring writers to explore writing through the lens of different cultures and to cultivate a unique collection of words. To create more conversation about immigration and get to the core of issues, Herrera preached increased information flow. 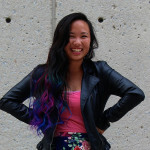 With modern technology, students can discuss current issues and share their stories instantly. That communication is essential, and allows for the creation of community through storytelling, he told the Wheel. Herrera relates his parents’ immigration story in his work to honor them. They led a “limited resource life,” and he remembers them as brave and hardworking. It’s a story Herrera believes resonates with millions of families today. He encountered students at Fresno State — where he taught as a professor from 1990 to 2004 — and in his work as poet laureate, all of whom share similar stories of immigration, he said. Writing can only “transmute” the immigrant experience, he said, recognizing that writing about an experience cannot completely capture the experience of living it. At the poem’s conclusion, Herrera grinned, delighted. After he finished his planned reading, the audience called for an encore. Herrera, laughing, danced across the stage to their chants, then returned to the podium for a final poem. He smiled. He coaxed the audience members of their shell and, in a 90 minute-reading, created a community of poetry.